There are several elements of 12-bar blues on the harmonica, including playing the root note of each chord in the 12-bar verse, playing rhythm chords over the 12-bar verse, playing the same line over the three different parts of the verse, and playing wailing notes. Each element is embodied in a tune that you can play in second position. Why not get started just by playing the chords of 12-bar blues? “Ridin’ the Changes” does just that. 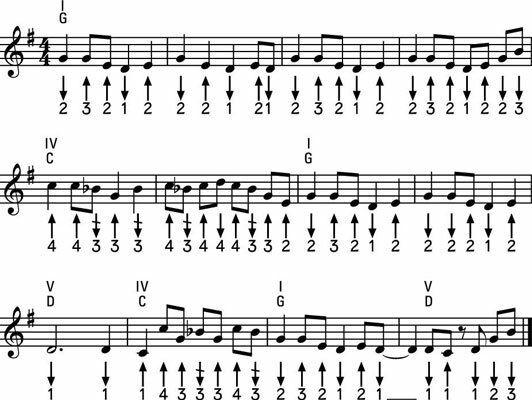 Check out the chords in sequence, playing a simple rhythm on each chord. 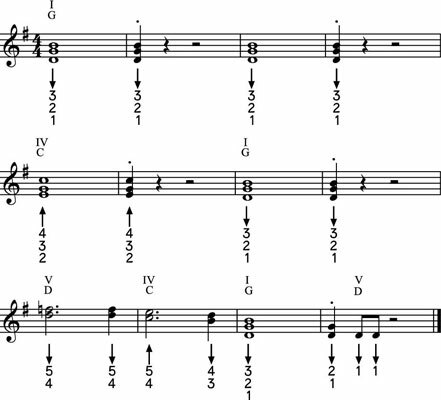 After you master the rhythm tabbed out here, try making up your own rhythms for these chords and playing them along with the backing track with the right channel silenced so that you don’t hear the written harmonica part. Sometimes harmonica can cover a rhythm guitar part and stay in the background while adding body to the sound of a band. 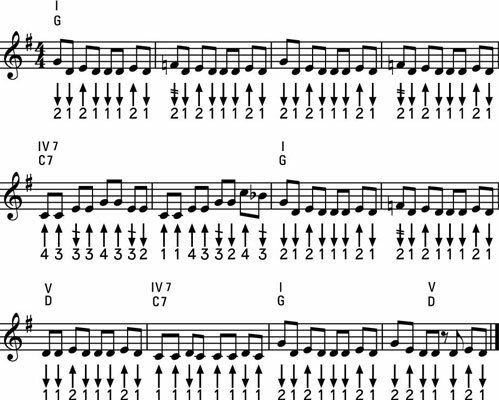 One of the most basic rock rhythms is the boogie-woogie rhythm that Chuck Berry borrowed from the left hand of pianist Johnnie Johnson and then passed on to the Rolling Stones and the Beach Boys. “Lucky Chuck” is a driving 12-bar blues that gives you a harmonica version of that Chuck Berry–style pattern. If you don’t have a good command of the Draw 2 deep bend that occurs in the second, fourth, and eighth bars, just substitute the first bar, which has no bends. You don’t have to stick with the single notes that are tabbed out. Adding the sound of the neighboring hole to the left or right helps fill out the sound. You can also use tongue slaps and pulls. Tabbing out these combinations is way too fussy to read easily, so just remember to experiment and try for a sound like the one you hear on the recorded track. “Buster’s Boogie” is a harmonica instrumental that fills three verses of 12-bar blues in a jaunty, feel-good mood that borrows a little from R&B singer Buster Brown and a little from early Rolling Stones. 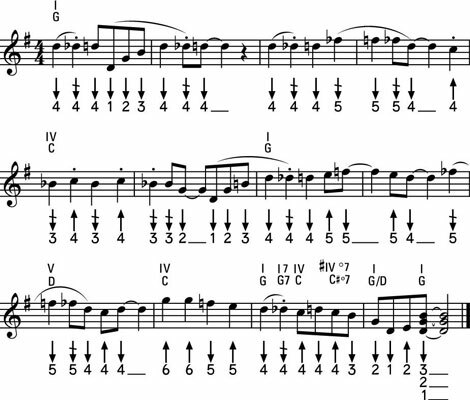 Notice how the rhythm that the harmonica plays is similar in the first and second verses and then changes in the third verse to increase the intensity level. 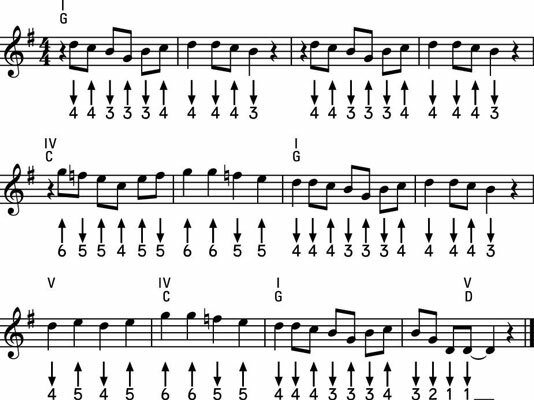 The first verse stays mostly in Holes 3 and 4, and the harmonica doesn’t always play the first beat of the bar. The second verse goes down to hang out in Holes 1 and 2 and starts playing the first beat, scratching the itch left by the first verse. The third verse is the “driving” verse that goes up to Holes 4 and 5 and keeps insisting on Draw 4, driving the tune to a conclusion.